HEY THAT IS TRULEY A BIG BUCK. I HAVE SEEN ONE BUCK IN MY LIFE THAT WAS CLOSE TO THAT BIG O I DONT THINK IT WAS 50 INCHES WIDE THOE MABY 43 THE BIGGIST BUCK I HAVE EVERY KILLED IS A 38 INCH 11X12 WITH A 10 INCH DROP ON ONE SIDE I HAVE KILLED ORTHER BIG BUCKS TOO NOTHING LIKE THAT THOE ONLY IN MY DREAM HOPE TO SOME DAY WELL GOOD LUCK HUNTING TO ALL!!!!!!!!!!!! I love it when someone takes a look and instantly accuses others of doctoring the photo or responding with some other smart a** remark. This buck is very well known around Mule Deer circles. It’s the Mundy buck: It is over 49 inches wide with a net B&C score around 288 and has one of the biggest typical frames ever recorded. I believe someone else posted the actual measurements further down the list of comments. It does’nt get any better than that, awesom buck you’ve got to be proud of that!!!!!! 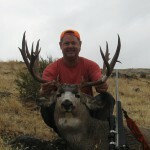 I’m 15 and i’ve always wanted to go mule deer hunting.I’ve shot 5 whitetails. 2 bucks and 3 does. NICE DEER!!!!!! And I thought that Bill Jorgan could hunt, nice deer !!! nice photoshoping!!!!!!!!!!!!!!!!!!!!!!!!!!!!!!!!! she just enlarged the antlers! its so easy! No photoshop here my friend, this is the REAL DEAL!! i wish i was hunting with you that day you shot that i would of got there before you. that is a realy nice rack. this Deer was killed in northern New Mexico. I met a man today who showed me an original photo of this huge buck. And it is the mundy buck. He also showed me pictures of more bucks that were killed on the same ranch.They were all HUGE!! Jim NM. 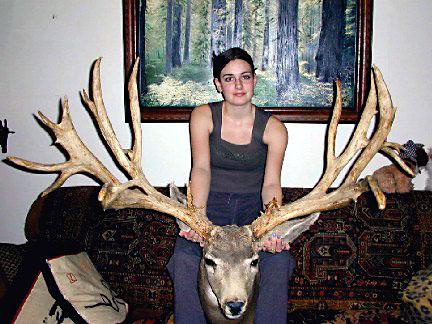 this big of buck would be in the records, Why havent I seen it there? i’ve seen many photos and read many articles on this deer. It truly is magnificent. for all those folks that think this is fake I know it is real. If real it is huge of course anyone who has the means can produce big bucks bulls whatever on a ranch, lets go somehwere where they are not feeding growth hormones and find one like this, otherwise huge buck, and what is the score. For those of you that are curious, here’s the skinny on this magnificant buck (It IS real, was NOT fed hormones, and was not shot by the young lady in the picture). The antlers from the Mundy buck are truly the most magnificent you will ever find on a mule deer. One glance from any mule deer lover and instantly you are amazed at the combination of width, height, and mass making this the epitome of trophy mule deer. Just how big is this buck? The buck holds claim to the world record for the Burkett System for displacement of water with the antlers weighing 13 1/2 lbs. It also is the widest mule deer entered in the Boone and Crockett books coming in at 49 2/8 inches, has a net typical frame of 237 inches and 51 3/8 inches of non-typical points. Add all of this up and it gives you a final score of 288 6/8 B&C and ranking #31 all time. However, the story behind the Mundy buck is interesting in its own right. According to Bill Mundy, owner of the Mundy Ranch in New Mexico, this buck was harvested by Frank Maestas from Albuquerque in 1962. Frank was operating some heavy equipment for Bill on the ranch and doing a good job. To compensate Frank for his fine work, Bill gave Frank a free hunt on the Mundy Ranch. Not only did he give him a free hunt, but told Frank where a huge buck had been hanging out. Apparently Billís 14-year-old son, Jim, had been in sheep camp all summer on the ranch, had seen a huge buck many times and knew of his whereabouts. However, the deal was made that if Frank did harvest this huge buck, the ranch would keep the head but Frank would get credit for it in Boone and Crockett. The day of the hunt, Frank was given a map of where this buck was and how to get there. Within 2 1/2 hours Frank had spotted the buck just 200 yards from where Jim told him he would be. From here the rest is history. Frank harvested the buck and is the official hunter in the Boone and Crockett book while the head stayed at the Mundy Ranch according to the original deal. However, this past spring, Ed Maestas, one of Frankís nephews, met with the current owner of the Mundy Buck (Rainbowís End Bed and Breakfast in Challis, Idaho) and explained that the wrong uncle has his name in the record book. Frankís brother, David, should have his name in the record book instead. Frank did not shoot the buck, but was the one who took it to be scored. David was the one who sold the antlers to Mundy for $100. Main Beams: R-30 4/8" L-31 6/8"